Chicago - The video of a "magical piano" spreading holiday cheer at Chicago's Union Station has gone viral, with more than 1.3 million views in four days. 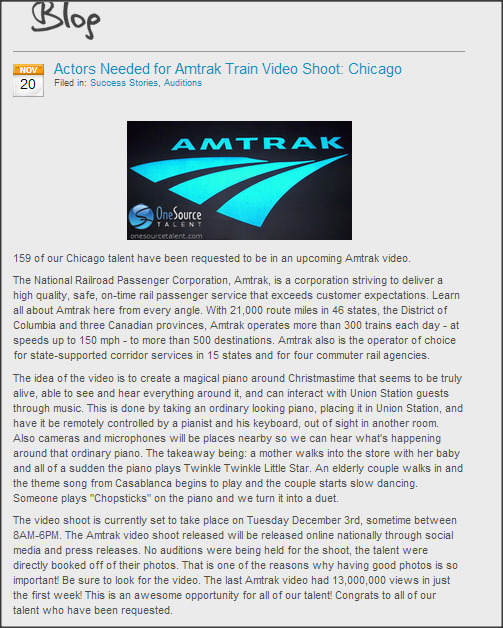 Youtube RobBlissCreative partnered with Amtrak for this unique project. Passersby at the train station were able to interact with the seemingly lonely, average piano. As they played the keys on the piano, it would respond to their interaction on its own. A solo on any other piano became a duet on this "magic" piano. Not only would the piano duet with the participants, it would also surprise people posing for a picture. When someone would sit on the bench for a photo with the seemingly ordinary piano, the keys would start moving without warning. The "magic" piano seems to have a sense of humor with its pranking of unsuspecting travelers. Of course, it is not actually magic. Pianist Andrew Blendermann directed the keys of the piano from a high-tech control room. Nevertheless, there is sheer joy plastered on the faces of people as they observe the piano. In particular, one little girl at the beginning of the video sits down to play the classic "Chopsticks." She smiles with glee as her solo turns into a duet with the magic piano. The video looks like a Christmas classic with a grumpy businessman yelling on his phone, an older gentleman having his own dance party, and roving musicians having spontaneous jam sessions with the piano. Even Santa Claus can't help but admire the magic piano as he walks by. However, there is some controversy surrounding the heartwarming video. Reddit users were able to uncover a casting call that perfectly described the situation and location. There is even an Imgur picture of the advertisement. Rob Bliss, of RobBlissCreative, admits there was a casting call, but insists the video was not scripted. He said, "We simply told people the idea of what was happening and invited them to come check [it] out if they wanted to." Bliss continued, "We wanted to encourage as much participation as possible, so we tried to publicize the event in advance but didn't give people specific instruction of what to do, just to come see it and interact, and we'll just record it all." Though many are soured by the idea of the video being at least partly staged, others are not deterred by the casting issue. With more than 14,000 "likes" and less than 1,000 "dislikes" on Youtube, it seems most viewers are more captivated by the magic and holiday spirit of the video, rather than the background details.